The weather continued cold and wet. A brief sunrise revealed the snow line had advanced down the Kepler Mountains. 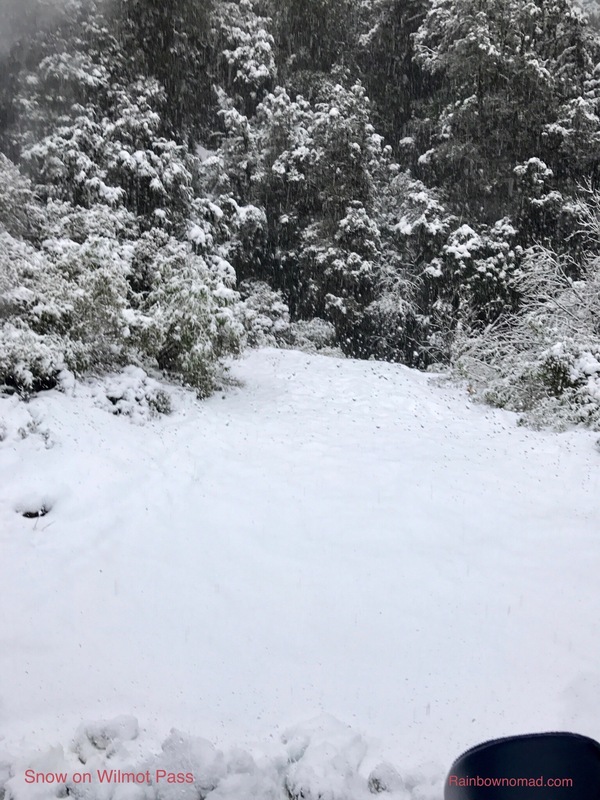 Our tour to Milford Sound was cancelled due to an avalanche closing the road! 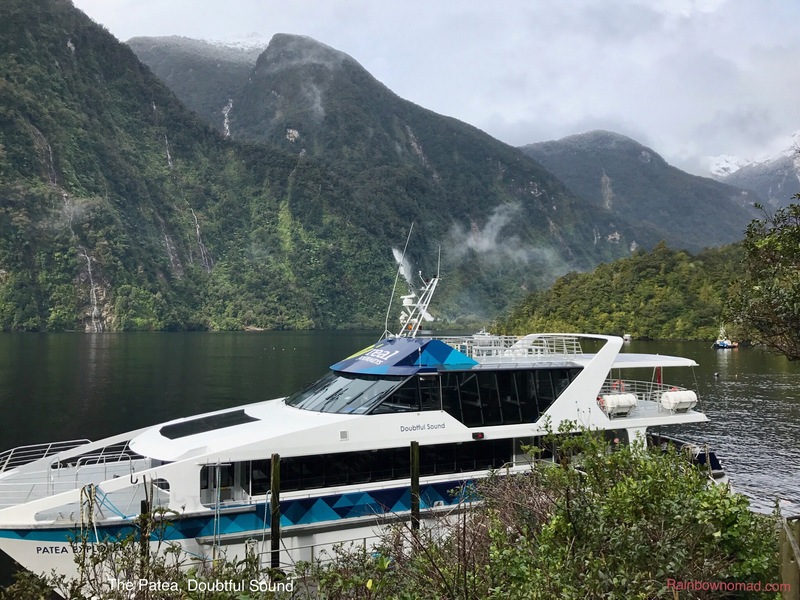 The alternative option was a trip up Lake Manapouri, over the mountains and down to Doubtful Sound, so we like hundreds of others joined the Real Journeys tour, instead. 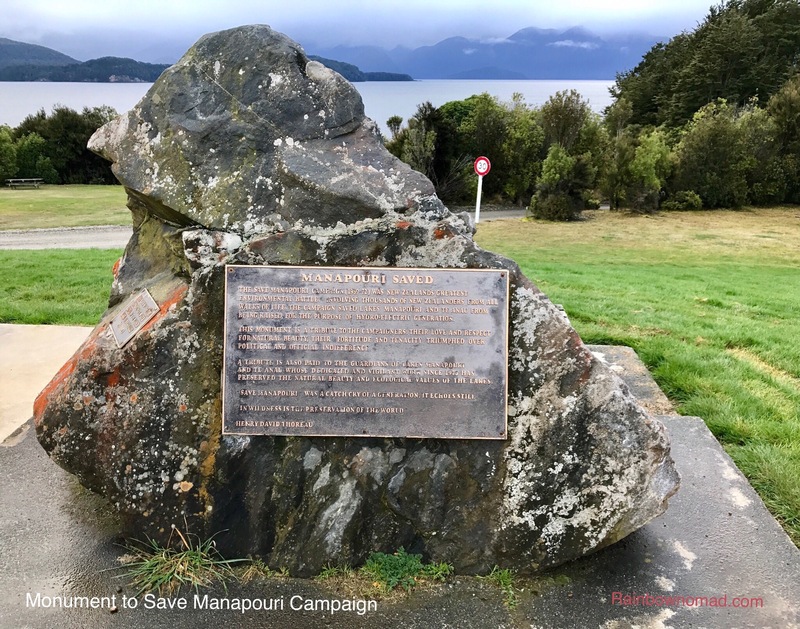 The tour begins with a cruise up Lake Manapouri, famous for the ‘Save Manapouri Campaign’ from 1959-1972. 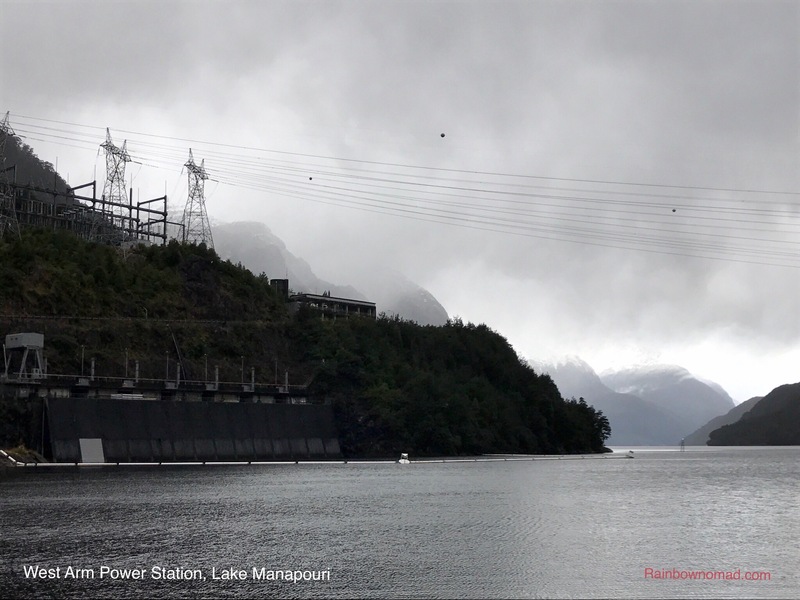 This campaign prevented the NZ government artificially raising the lake waters 30m to generate hydroelectricity for the aluminium smelter at Bluff and flooding the pristine forest. The power plant was built but without disturbing the natural rhythm of rise and fall of the lake and continues to be monitored and protected by an independent body, the Guardians of the Lakes. I remember this campaign well from my previous visit in 1970 and how it inspired Australia’s ‘Save the Franklin Campaign’ in Tasmania and my first taste of environmental activism by signing the NZ protest petition. 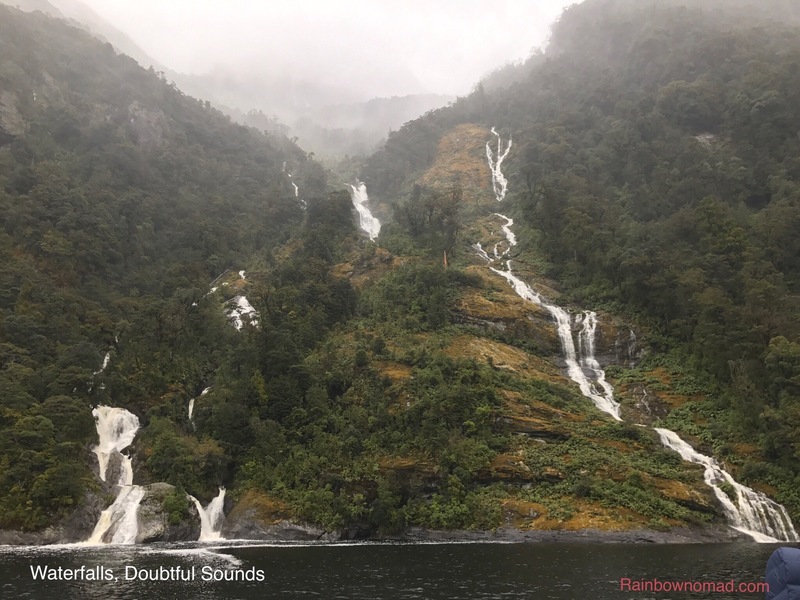 Both Lake Te Anau and Lake Manapouri are over 100m above sea level and the water level is moderated by high rainfall via the Waiau River connecting the two lakes and entrance to the sea at Doubtful Sound. We collected our picnic lunch at the ferry terminal and milled about in the rain, before being jammed in with Singaporeans, Japanese, Thai and Indian Australians – our immediate companions. As my Google Translator was still set on Japanese to English, I managed a limited conversation with the Japanese gent next to me. Outside the West Arm power station we divided into coaches to take us over the 671m Wilmot Pass. Alan, our bus driver, laughingly pointed out the exit windows in case he rolled the bus! We noted there were no seat belts. He told us the gradient on the eastern side of the pass was 1 in 6 and he hoped he wouldn’t have to get out and put snow chains on the wheels. As we climbed, sleet spattered the windows and the fabulous silver beech forest became increasingly blanketed in snow. Alan informed us that we were in pristine ancient forest, where mosses form the soil substrate for the beech to cling onto the hard granite mountains. Rainfall on western range averages 9m/year. We were lost in wonder at this commentary when suddenly the bus ground to a halt. A false start had the wheels slipping. Alan suggested that those of us in the middle of the bus stand up and move back, so there was more weight in the rear. 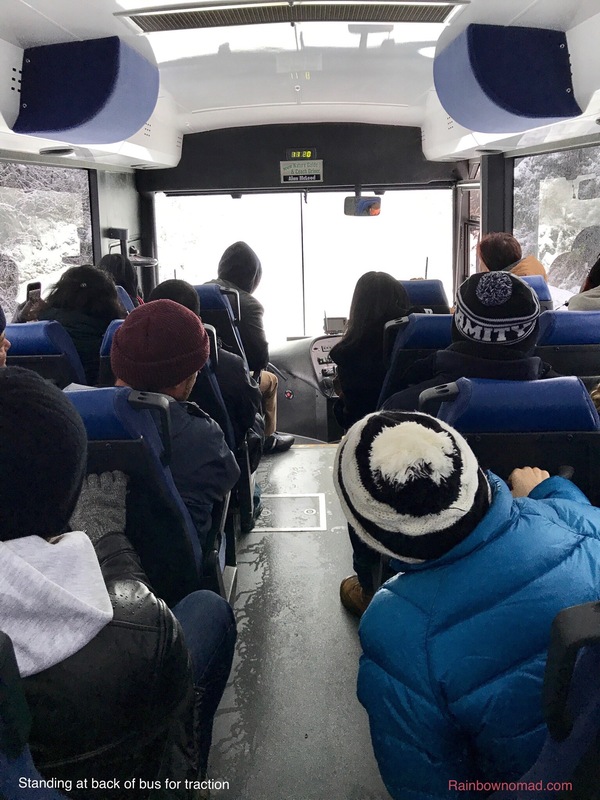 The bus in low gear moaned and groaned trying to move forward before we started slipping sideways and the rear passengers yelled out to stop! Alan leapt outside. The convoy behind also piled up and the drivers conferred. Apparently the diff lock was not engaged. Problem sorted we were on our way with a few cheers from the passengers. 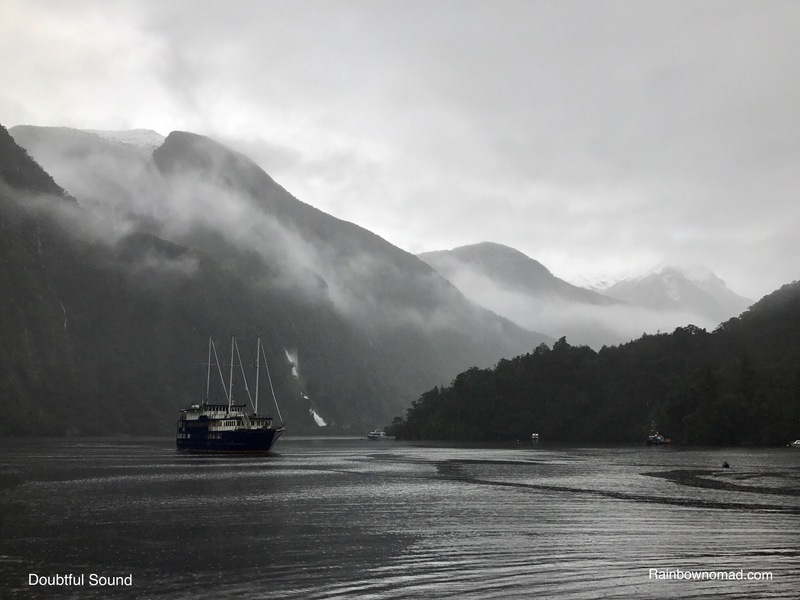 The trip up Doubtful Sound, which is a actually a fiord – created by glaciers, as opposed to a Sound created by rivers – was like a black and white movie, except it was in colour. Misting cloud covered the mountains and cascading waterfalls spilled over sheer rock faces and spouted between evergreen forest. Our brochure stated that according to Maori legend, the fiords were created by the god Tu-TeRaki-Whanoa to provide refuge from the storming seas outside. The indomitable James Cook in 1790 christened the harbour Doubtful as he believed if sailing in, it would be doubtful he could sail out – right into the face of the Roaring Forty winds. Our catamaran sailed up to the Shelter Islands, jutting rocks at the mouth of the Sound, before moving into the lee of the land. 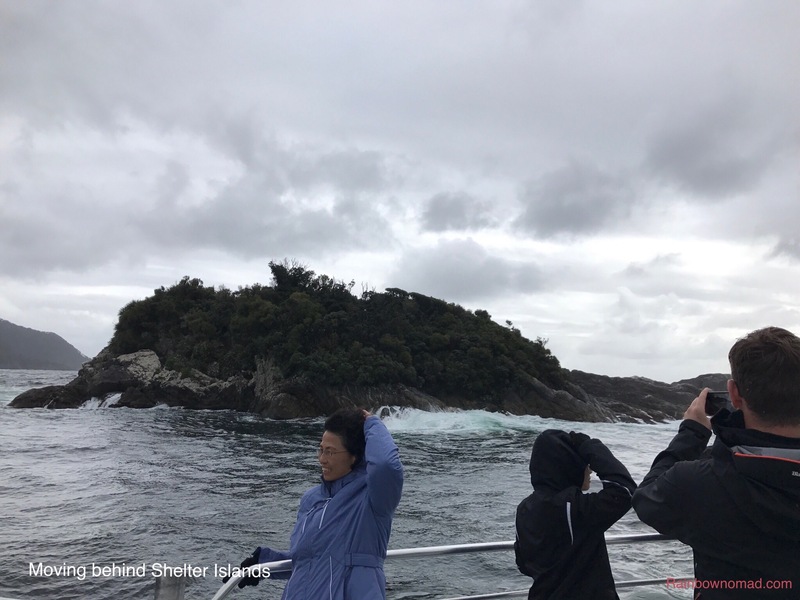 Cormorants and gulls braved the wind but no crested or blue penguins, rare species found in the Fiordland waters. We did spot a fur seal on the rocks, marking the Spanish landing of Maraspina’s scientific expedition in 1793. 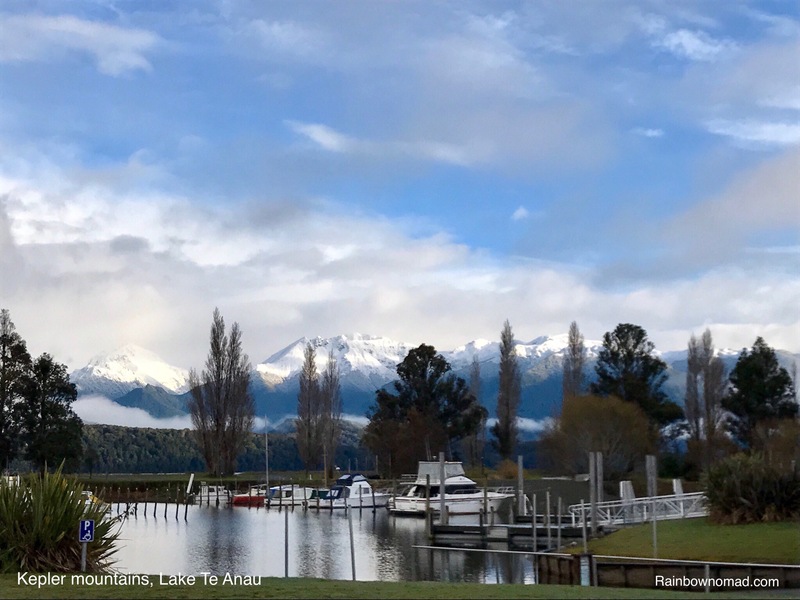 Our return to Te Anau was uneventful however overnight the wind speed picked up and the temperatures dropped to zero. 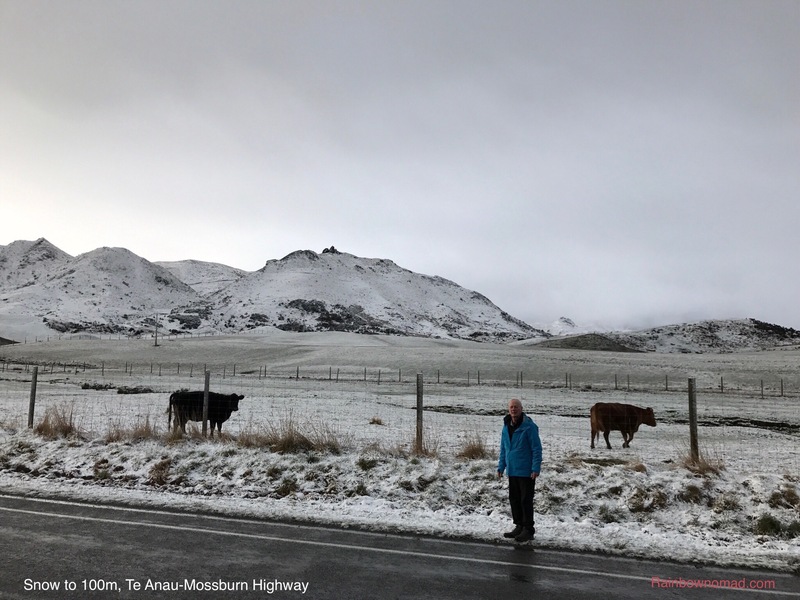 We packed up, dressed in multiple layers of thermals and woolly clothes to set off from Te Anau to Invercargill. 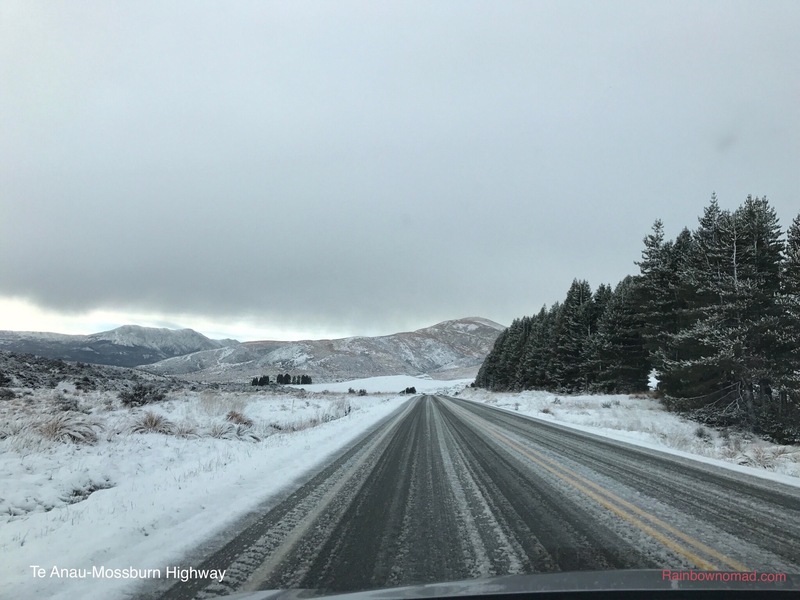 The snow line reached 100m and at 7.30am we headed south to the coast over snowy roads, knowing we had neither diff locks or snow chains.